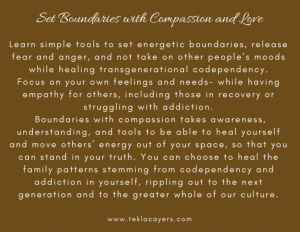 Learn simple tools to set energetic boundaries, release fear and anger, and not take on other people’s moods while healing transgenerational codependency. Focus on your own feelings and needs- while having empathy for others, including those in recovery or struggling with addiction. Do you have a hard time setting boundaries with others, especially those people in your life who “need to be fixed”? Are you attracted to them? Do you love to help others? Does it seem normal to put others first, to put your needs last? Are you finding it to be exhausting to try and fix/save everyone else while continuing to hold unattainable standards for how you show up in the world? Do you desire to know a way to separate from other people’s energy, because you feel so drained and emotional, whether it is your spouse, parent, in-laws, kids, best friend or co-worker? When you look at your family history, where might there be addiction? It doesn’t have to be in your immediate family, but somewhere you learned the patterns of giving away your energy and not setting your own energetic boundaries, which often leads to resentment, anger, and not a lot of self-care. The transgenerational impact of addiction on families isn’t talked about much in our society, which does not recognize mental illness and addiction as diseases that need nurturing, compassion, empathy and understanding. Often, the elephant in the room is that families have no idea how to begin healing ineffective family patterns and cycles, and so they are passed on for generations. I’ve created a one-day workshop (soon to be followed by series of mini-workshops) that provides education about codependency and the disease of addiction, and how it affects families. Our work will include discussions, guided meditations, and education around tools that you can use to set your own energetic boundaries. Throughout the day there is time for self-reflection and, using the meditations you will move and release energy that is not yours. You will leave the workshop with the tools to be around and hold space for others without getting sucked into their emotions. You will also walk away with more compassion and love for yourself and others in your life. I have been on a path of healing and recovery from being part of a family impacted by mental illness and addiction, and the information and tools I teach in this class have helped me find the compassion and empathy for myself and others in a profound way. 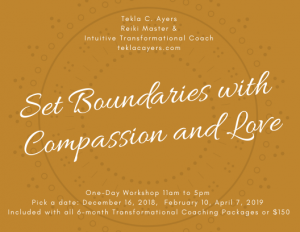 I offer this class as part of all of my Intuitive Transformational Coaching with Reiki packages, as everyone can use these tools to start healing the patterns of codependency and addiction that hold strong in families and our entire culture and society. Some of the patterns that persist in families impacted by addiction include family members playing certain roles, which include the martyr, the workaholic, the peacemaker, and the caregiver. People tend to get tangled in each other’s energy and don’t even know which emotions are theirs and which belong to someone else. You can break these patterns in yourself and heal from these family diseases. It takes awareness, understanding, and tools to set energetic boundaries, move others’ energy so that you can stand in your truth. You can choose to heal the patterns stemming from codependency and addiction in yourself, rippling out to the next generation and to the greater whole of our culture. Day-long workshop with a one-hour lunch break- bring your lunch or go to a nearby restaurant. Class is included with all 6-month coaching packages or $150 for the day.